Listed at 230,625 € inlcuding agency commission of 2.5% (5,625€). Located just outside the village of Rouillac in a small hamlet a perfect combination, a large 3 bed family home PLUS a one bedroom/bath gîte as well as a private lake. The village of Rouillac is a short distance which has a bar, general store, garage and bakery. 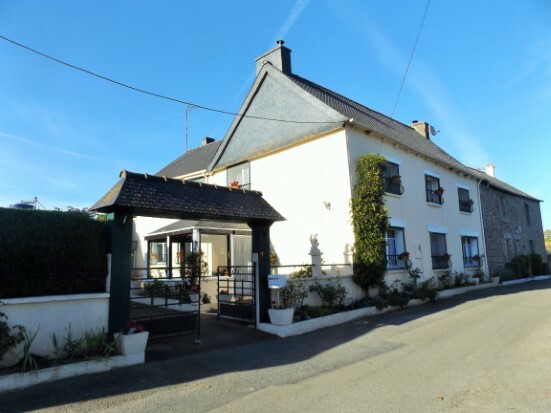 The property consists of a large main house and a gîte around a central, enclosed courtyard, with over 3 acres of land including an orchard, a beautiful lake of approximately an acre, a stream and small woodland. You enter the main house is through a veranda into a large lounge, with exposed beams and with a traditional stone fireplace complete with log burning insert. To the left is the large dining room, again with exposed beams and a stone fireplace. Off the dining room is a useful storage/boiler room with ample storage space. Through French Doors from the living room there is a well-equipped fitted kitchen. There is also a WC on this level. Stairs from this floor leads to the first floor where there are 3 good sized bedrooms, all with fitted wardrobes. There is a large family bathroom with corner bath and large shower with additional storage room there is also a separate WC. The gîte is open planned with living area with a well fitted kitchen complete with its own traditional French bread oven. There is also a larger than average shower room and a double bedroom. From the sunny raised terrace you can enjoy the wonderful landscaped garden as well as enjoying the beautiful countryside. To the rear of the property there is a large rear garden with Hot tub complete private with hedging, there is additional parking space to the rear of the Gite. On the opposite side of the small lane, there is a detached double garage with 2 attached shed. This is as where the beautiful private lake, that has abundance of fish, orchard. The property located at the gateway to countryside walks & cycling routes, the stunning beaches of the emerald coast, and the culture and vibe of cities such as Rennes and Dinan. With easy access to the airports of Dinard, Nantes and Brest and the ports of St Malo, Caen and Cherbourg. The town of Broons is the local town (10 min drive) where you will find supermarkets, banks, pharmacy, eateries and bars/tabac. The town of Jugon Les Lacs, le Petite Cite de Caractère, is also 15 minute drive and is well worth a visit. It offers a small selection of restaurants and shops, with quaint narrow streets and buildings it is bordered by a two vast lakes offering kayaking, pedal boats and fishing, it even has an outdoor lido for the summer months! A little bit further is the medieval town of Dinan, with its 3km long ramparts, half-timber framed buildings and cobbled streets , it is one of Brittany's most attractive and well preserved towns, transporting you back to another era, the early castle of Dinan features in the Bayeux Tapestry! A 35-40 minute drive will take you to vast, golden beaches along the emerald coast from Val Andre through to Dinard, with its 19th century aristocratic cliff top mansions. The coastline offers spectacular walks, water sports, restaurants and coastal market towns. Tiled flooring, exposed beams, windows to front, featured fireplace with wood burner insert, French doors to Kitchen, door to dining room. Stairs to first floor. Fully equipped kitchen, window to front, tiled flooring, tiled surround ample cabinets and counter space with gas oven and extractor fan. Tiled flooring, Windows to courtyard, corner featured fireplace, exposed beams, access to storage/boiler room. Tiled flooring, housing for boiler, ample storage, water and dryer hook ups. Landing/corridor, wood flooring, window to front. Fitted mirrored wardrobes, wood flooring, windows to front and courtyard. Tiled flooring, windows to courtyard, Bread oven, fitted kitchen, separated by small wall, area of wood panelling in living room area. Door to bedroom and rear bathroom. Large bathroom, with tiled flooring and oversized tiled shower, built in storage with hot water tank. Window to rear, electric towel rail.